Recently the Journal of Oral and Facial Pain and Headache published a systematic review of Acupuncture in Temporomadibular Disorder Myofascial Pain Treatment. The databases used were the Cochrane Library, PubMed, Scopus, and Web of Science; the dates of the articles surveyed ranged from 1990 to May 2015. The inclusion criteria were: (1) publications in English, Portuguese, or Spanish; (2) controlled clinical trials; (3) patients with TMD of muscular origin; and (4) studies that used acupuncture or laser acupuncture only for treatment. The reference of the article is: Aupuncture in Temporomandibular Disorder Myofascial Pain Treatment: A Systematic Review. J Oral Facial Pain Headache. 2017 Summer;31(3):225-232. Fernandes AC, Duarte Moura DM, Da Silva LGD, De Almeida EO, Barbosa GAS. A total of four randomized clinical trials using acupuncture (traditional, trigger point, and laser) for TMD treatment met the eligibility criteria and were included. Despite the weak scientific evidence supporting its efficacy, acupuncture treatment appears to relieve the signs and symptoms of pain in myofascial TMD. More controlled and randomized clinical trials with larger sample sizes are needed in this field of research to verify these initial findings. 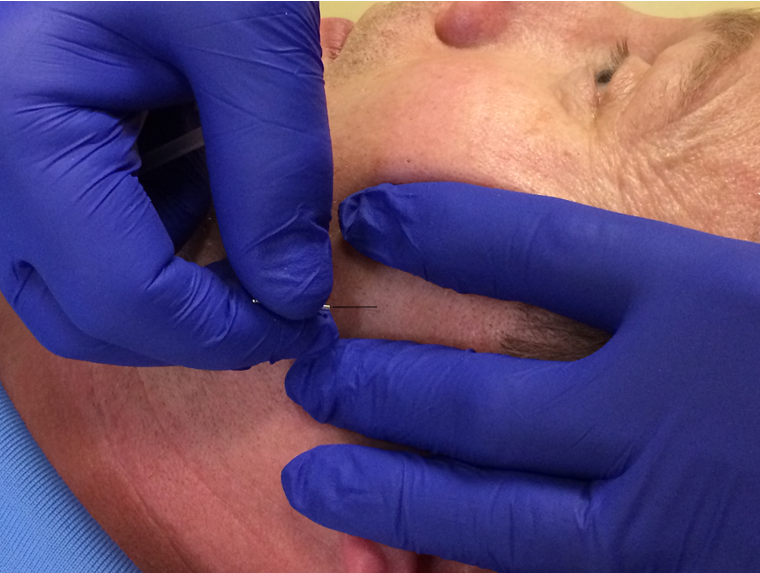 What I found interesting, given that I am certified in dry needling vs. acupuncture, is the significant overlap in acupuncture points specific for temporomandibular pain and the areas we frequently dry needle. Now my stance remains, that the only similarity between acupuncture and dry needling is the tool we use, a mono filament needle. The science, philosophy and approach are completely different between the two, but we cannot ignore the overlap between acupuncture points and trigger points that we dry needle. In any case, I believe one of the most effective ways to treat temporomandibular, facial pain, and headache patients is to collaborate with other health care professionals that offer a different skillset. When we work together our patients have a more successful outcome. I have put together a PDF of the most frequently utilized acupuncture points that can help reduce myofascial pain in the TMD patient. And if you are at all familiar with some of the wonderful research, my colleague, Steve Kraus has recently published, we know that the largest subset of patients diagnosed with temporomandibular disorders is myofascial pain, and the most common concurrent diagnostic subset identiﬁed in patients with osteoarthritis/arthralgia or disc derangements is myofascial pain. The most prudent thing to do in the clinical setting would be to manage myofascial pain. Managing myofascial pain often reduces pain and dysfunction associated with group II and III diagnoses. But please know, just treating muscle will not necessarily provide a full recovery or resolution of someone’s temporomandibular pain, especially if they also have disc derangements or severe degenerative joint disease. This still requires the ability of a skilled TMD PT, and other health care professionals skilled in TMD to provide a comprehensive outcome. The PDF I discussed above demonstrates the various acupuncture and dry needling points that were used in the 4 studies by Johansson et al (1991), Smith et al (2007), Katsoulis (2010) et al, and Itoh et al (2012). Also using the acupuncture assistant app, TCM Points I was able to visually display the various points used in the above mentioned articles. I would think for most acupuncturist this app is a wonderful tool!